When extreme weather comes to the Nation’s Capital so do reporters from The Weather Channel. Be it “Snowmageddon” or triple-digit heat that’s the time to setup lights, camera, phones, and mics out in front of 400 N. Capitol Street and send live reports every half hour for the next 14 hours. NBC bought the Atlanta-based The Weather Channel (from one of Peter Roof’s former employers, Landmark Communications) a few years ago. Many technical services are now provided to them from NBC NewsChannel. 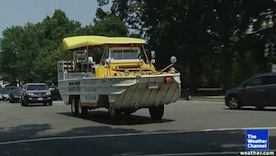 To illustrate the heat on one of DC’s main industries, tourism, photographer Peter Roof and reporter Eric Fisher went along for a ride on a“DC Duck” which is a part of a fleet of amphibious vehicles. These 50-plus-year-old military utility vehicles have been modified to carry passengers. Click here to view the finished story.